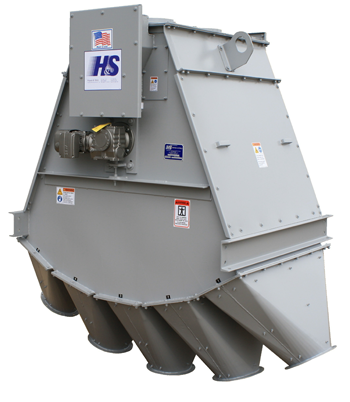 The Hayes & Stolz Swing Valve Distributor gives an alternative to rotary type distributors. The in-line style of a swing valve gives additional flexibility in layout and plant design. The swing spout design uses a reversing starter allowing spout travel in either direction for positioning over the desired pre-selected outlet. The SVE Distributor is offered in either single inlet (SVES) or dual inlet (SVED) configurations. The dual inlet unit enables you to receive from two separate sources and to load two different locations at the same time. The standard sizes for Model SVE Distributors range from 6″ to 24″ diameter inlets/outlets and are available with three (3) to eight (8) outlets. The angle of the internal spout for flowability is standard at 50°. See Features/Options tab for available options for Hayes & Stolz Model SVE Distributors.